First time I wrote a letter was when I was 12. Probably. My mother is so sweet, she encouraged us – me and my sister – to write to our Nana who lived with the rest of our maternal family in village Naultha (Haryana). In primary school, we learned to write only on ruled paper. Therefore, our alphabets and words would look like they have been spilled over from a bowl on that 25 paisa yellow colored postcard. We used to split space. My sister would write first half and I would write the next half of the letter. That is why I love my mother so much. She taught us to write and express. In order to get more comfortable on this plain blank surface to write, we drew lines, which helped us write better. Many years later, when I went to college, I went so far from home that my only family was my friends. I made some really close friends at IIT. Staying in Guwahati by the banks of river Brahmputra, we would spend so much time with each other that we inevitably became close. It had such a strong impression on me that when I went home for summer vacation, I found that vacation really long and wanted to stay in touch with my friends from college. I didn’t have a mobile back then. I am not sure if us kids were allowed to make much calls on landline. I guess no one was allowed, we would mostly use that for listening only! I perhaps foresaw this. Or may be not. Either way, I used to carry this little red diary, in which I would keep details of my friends. More so because of my stupid memory that never served me well enough. In first semester itself, I met 200 boys. How would I remember them? In that little diary, I would write their name, room number and any other detail that could help me place them in my memory, like long ear, or native place, or extra teeth or musical speech or ultra small short. As the time passed, when I got close to some of them, I would update their contact with their address. That is why in the summer vacation, I was able to write yellow postcards to many of my friends. That was my first adult experience of writing letter. Since then, in the rest of my life, I have been writing letters to many in friends and family. Some of them are probably in the same city or State as mine, some are in different continent. But over the past few years, I have written so many letters that I wanted to reflect on why I still hand-write letters. Letters, I find them very intimate form of correspondence. When I write to someone, I actually think more deeply of him or her before penning any word because I know there won’t be any delete button here. That is why, after writing hello, I take pause, sometimes long pause to think of them. If I miss something somewhere in some paragraph, I have to become creative to weave a story in which I can fit the missing piece in. Often, I write to people who are not single. They are mothers or fathers or husband or wife. So I actually write to entire family without doing BCC J . Just like most arts, writing letters require undivided focus. If the internet is ON, it takes forever to even draft an email, because many alerts coming from all directions will distract you. No wonder, some of the most expressive letters I have written were either aboard some flight or when there was no power in my apartment and I wrote them in candlelight. Writing a letter is an exercise in patience. Unlike emails, which get to friends at the click or touch of a button, letters are quite an elaborate process. Writing indeed is a big part of it. For that I don’t need much paraphernalia. I usually carry a notebook to most places. So whenever I am bored or have time or think of some friend or notice something amusing that is worth sharing with someone, I look for a blank page and start penning down. But that’s only half the battle won. Going home, looking up the address, and slapping the appropriate stamp are subsequent big steps. Then comes my inertia and laziness that comes in the way of me taking the envelope to the red post box. If it’s an international letter, then a major obstacle is finding someone who is going to a foreign country whose stamps I already have. It usually is America. I could send using India Post too, but I am sometimes skeptical when I use ordinary Rs 25 stamp, which anyway takes 20-25 days for the letter to get to its destination. So you see, a written letter sealed in an envelope really screams at me every day till it gets out of my hands. Once it has left my premises, then each day I wonder if it has reached. After a while, I forget that I wrote it. Or sometimes I give up. Sometimes when I think of that friend after a month, I send an email to know if receive it. There have been times when my friend got it, read it, but forgot to let me know. 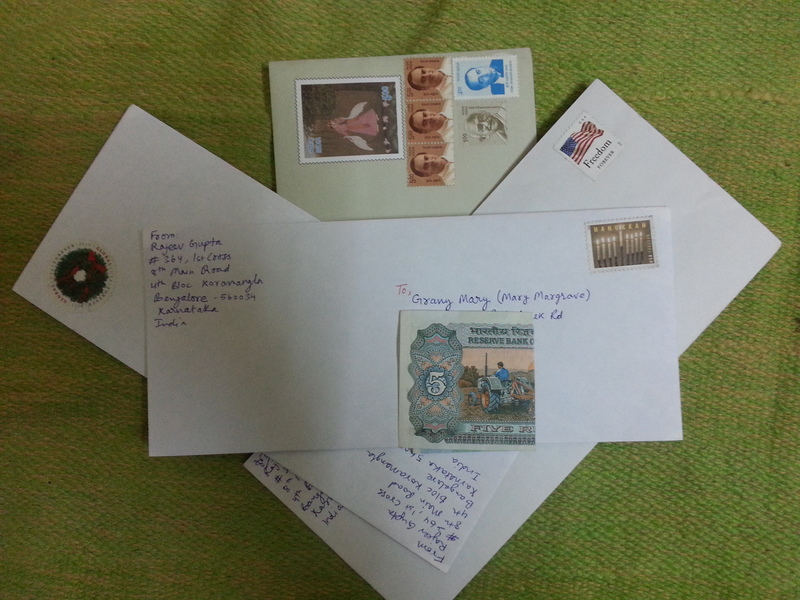 Thus, a lot of patience is needed in enjoying the complete process of letter writing. Recently, I was cleaning my old closets and I found the print of an eCard that a friend sent to me on my 19th birthday. Had it not been for this print, I would have never seen those most special words – “Happy Birthday to the sweetest and dearest friend”. Back in those days, such words were not used very liberally. They were actually used for some really sweet and dear. That is why letters really help to see the past, look at old stories once in a while. How many of us really dig into emails from five years ago or Facebook pictures of that much past. While cleaning those closets, I even found printed pictures from a Euro trip.. during Orkut days. I have no idea in which hard disk those images might be saved. But these pictures reminded me of old friendships. Letters involve longing. Even though I find Gita’s principle of karm most applicable in letter writing – do the deed (write letter) and never except results or reply, I still sometimes long for a reply, physical or electronic. Just the fact that they felt happy makes my day. I remember the film Gaman, in which Smita Patil, living in a village near Lucknow has just one way of being in touch with Om Puri, her husband in Bombay – letters. No phones nothing. She would read that one letter from him every night. That piece of paper was all she had to feel the touch of her husband, after all he actually wrote it. Once I got a reply from Japan. It was quite an educational process for me because the stamp itself was fascinating and motivated me to look up the person on Google and learn about that. Similar I learned once about Rosa Parks because of the stamp on the letter from a friend. These stamps carry stories of the culture of recipient. That’s why ideally, I would prefer sending letters using India Post with variety of stamps on the envelope. While in Delhi, I end up getting the stamps of only Gandhi’s, in the south I see a variety – of different leaders like Ambedkar, of different events and symbols. Posted on June 6, 2015 by rajeevgupta	• This entry was posted in Uncategorized. Bookmark the permalink.